1. Decide to completely change their style and go in an entirely opposite aesthetic direction for their new home. 2. Decide to keep furniture because it “cost a lot of money” rather than will it actually physically fit in the new space. Unfortunately the reality is that what you paid for something won’t make it fit or be of value to you in your new home. If you can’t move freely in the space because of your expensive dining table then it isn’t serving you. As for style change, the most common decision is to go “modern” like show suites or magazines. Modern is often confused with hard and uncomfortable. Remember you don’t change because you move, your desire for comfort while reading or watching TV doesn’t change so sitting on a hard white leather sofa, no matter how good looking it is will not allow you to live in the way that works for you. – Decide what you love and can’t imagine living without. – If it doesn’t let it go. 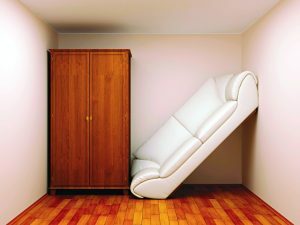 Downsizing or moving to a smaller place can be incredibly challenging. It might be exciting and it might be just what you want, but for most people it is not a comfortable experience. It means letting go of things that have deep meaning and history, things that connect you to your past and the people and memories that are uniquely yours. And yes they may have been expensive. The most important thing in this process is to honour the past and acknowledge it, and most importantly remind yourself they are just “things”. Then roll up your sleeves and start giving stuff away – unless you are a great wheeler dealer I don’t suggest selling things to strangers. If it is fine art or valuable antiques consign them because strangers haggling over your personal things is a really unpleasant experience. I say give it away and allow your history and the energy of the item to carry on. Start with family and friends and then call a charity who will come and get it! Your gift can make a huge difference to someone else. Let your stuff and you go in a new direction and enjoy the process and the freshness of a new start. Good Space can help so head over to our Get a Quote page and see what might work for you.